Credit: NASA/CXC/Rutgers/J.Warren & J.Hughes et al. In 1572, the Danish astronomer Tycho Brahe observed and studied the explosion of a star that became known as Tycho's supernova. 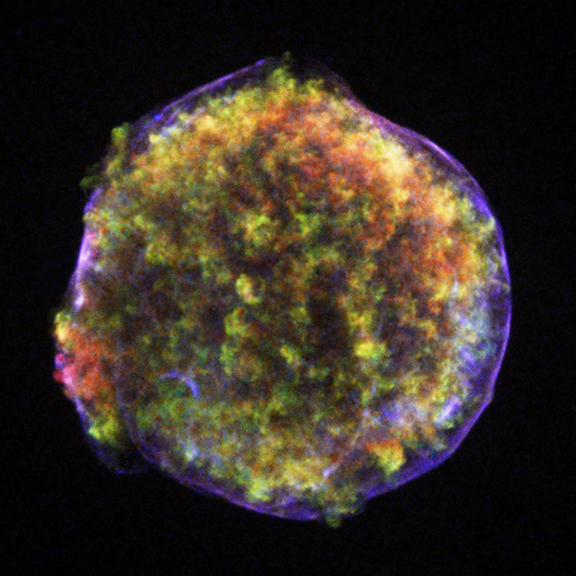 More than four centuries later, Chandra's image of the supernova remnant shows an expanding bubble of multimillion degree debris (green and red) inside a more rapidly moving shell of extremely high energy electrons (filamentary blue). The supersonic expansion (about six million miles per hour) of the stellar debris has created two X-ray emitting shock waves - one moving outward into the interstellar gas, and another moving back into the debris. These shock waves produce sudden, large changes in pressure and temperature, like an extreme version of sonic booms produced by the supersonic motion of airplanes. According to the standard theory, the outward-moving shock wave should be about 2 light years ahead of the stellar debris. What Chandra found instead is that the stellar debris has kept pace with the outer shock and is only about half a light year behind. The most likely explanation for this behavior is that a large fraction of the energy of the outward-moving shock wave is going into the acceleration of atomic nuclei to speeds approaching the speed of light. The Chandra observations provide the strongest evidence yet that nuclei are indeed accelerated and that the energy contained in the high-speed nuclei in Tycho's remnant is about 100 times that observed in high-speed electrons. This finding is important for understanding the origin of cosmic rays, the high-energy nuclei which pervade the Galaxy and constantly bombard the Earth. Since their discovery in the early years of the 20th century, many sources of cosmic rays have been proposed, including flares on the sun and similar events on other stars, pulsars, black hole accretion disks, and the prime suspect - supernova shock waves. Chandra's observations of Tycho's supernova remnant strengthen the case for this explanation. Credit NASA/CXC/Rutgers/J.Warren & J.Hughes et al. Scale Image is 10.5 arcmin across. Coordinates (J2000) RA 00h 25m 17s | Dec +64° 08´ 37"